California has a long history of earthquakes. Since 1979, California has experienced 32 earthquakes with a magnitude 5.5 or higher, with an unfortunate death toll of 141 individuals. While earthquakes themselves cause tremendous damage, fires or explosions due to gas line breaks can be more damaging than the actual earthquake itself. While earthquakes are unpredictable and beyond one’s control, preventative measures to help protect one’s family and personal property are within own control. It is recommended you shut off your gas immediately after an earthquake if you smell gas. If you are at work or away when an earthquake hits, then you may not be able to shut off the gas line in time. An earthquake valve will take care of this instantly for you. Having an earthquake valve on your gas meter installed is an economical and reliable way to guarantee the gas shuts off during the occurrence of an unpredictable earthquake. Contact E.Z. Roth Plumbing to install an automatic gas shut off valve in order to assure the safety and protection of your family and personal property during an earthquake. An earthquake valve or seismic valve is an automatic method to shut off the low pressure regulated gas supply to a structure during an earthquake of sufficient magnitude or if a pipe is broken, causing an excessive gas flow. These small devices are installed on the property gas meter and are designed to instantly stop the natural gas supply in order to protect your family and personal property should a gas leak or line break occur during an earthquake. 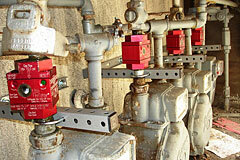 We install two types of valves; one is sensitive to motion and the other to excessive gas flow. The most secure installations would use one of each type connected in series. A metal ball is retained away from an orifice by sitting upon a ring. Any shaking of the mechanism will cause the ball to roll of its ledge and fall down to block the orifice. If activated, we reset the valve either with a magnetic device or an internal lift mechanism. If too sensitive a motion sensitive valve may be triggered by passing vehicles on a rough road. In the case of a severe seismic event, we completely inspect the gas piping for breaks before resetting and then use a gas detector “sniffing” device after resetting. Since all pilot lights will go out, we will insure that all appliances are properly restarted after the shut off valve is reset. A valve is closed when the gas flow exceeds a certain limit suitable for the gas application. This valve will only activate when a pipe is broken. Once activated, any faults in the piping must first be repaired. A great fear is an excessive flow sensor valve may not activate in the occurrence of small (yet potentially dangerous) leak.